So, last weekend was more of the same: no rain. But the rosemaries flowered just the same. And it was more of the same with chores: busy with the pruners and the saw. We’re on the final countdown, less than a month from now, to finish all the haircuts. By then, the plants will be awake and ready to eat, anxious to fuel up on slow release fertilizer and get going without last year’s split ends in their way. I finally got around to ordering a used copy of the American Horticultural Society Pruning & Training Manual. Along with pruning techniques for every plant you have in the garden, it explains why and when to prune (flowers on new wood or old? ), how to rejuvenate neglected plants, and when to recognize that it’s just too late. I don’t know how I made it this long without it. One thing I’ve pondered for a long time is how riled up gardeners get about pruning styles, with opinions as rigid as a good lopper. I don’t get it. I meet gardeners who find pleasure in meticulous manicuring a formal, restrained appearance. Others I meet find equal beauty in a plant’s natural form. In either case, as a witness to their joy, I find fascination through their art and their personalities, both garden and person. But diversity in style doesn’t mean that plants don’t need attention in a garden setting. Last year, Greg cleaned up wayward branches and suckers on our ‘Pride of Houston’ yaupon holly for a much healthier and prettier look. This year, I cut off new suckers and little stems, without altering its natural shape. And yes, I either need to get a brown hose or put this one away. As I look at the viburnums, I realize I shouldn’t have them go so long on their own. Now, I’ll be tipping and shaping them to encourage a natural, but less leggy screen to hide the fence. Last weekend, Greg also took the pruners to the suckers around the crape myrtle. Viewer question for you: how do you compost oak leaves in your lifetime? I’ll pass along your comments to my new CTG friend. Another viewer wanted to know where to get the soil temperature guide that John Dromgoole mentioned in last week’s segment. John got it online, but this question reminded me that I wanted to do it, too. There are thousands of entries, so pick your favorite. Next, I’m getting a soil thermometer. For one thing, this would be too fun. For another, when I plant from seed, this will spare me some pain. As you know, one day last week we were shivering, and the next, we were pulling out shorts. Then back again to shivering. But soil doesn’t change clothes that fast, and smart seeds don’t want to waste their brief chance to make history. 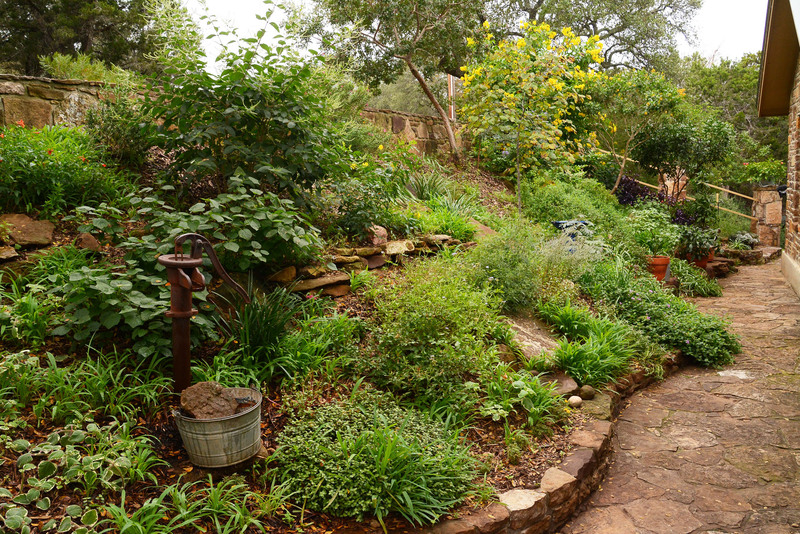 This week on CTG, Tom meets with Zac Zamora, biologist, craftsman, gardener, and designer. Along with vessels and birdbaths, created with ecological sensitivity, he designs natural living systems from exhibits for the San Diego Zoo to terrariums for gardeners at home. Check out the video of his leafcutter ant exhibit at the San Diego Zoo! He also shows us the turtle corral he built at his home. Zac even brought along some terrarium “talent” that really steals the show! Remember, if you miss this segment, or any others, we have them online under Video. I hope that our garden tour with passionate plant person Connie Devlin entices you to head to The Heart O’ Texas Orchid Society Show & Sale on February 7 & 8 at Zilker Botanical Garden. It’s also not too early to sign up for the Austin Herb Society’s visit with mystery author/herbal expert Susan Wittig Albert on February 21. From 9 a.m. – noon at Zilker Botanical Garden, she’ll share her ever-fascinating insight, this time on The Shakers & Their Herbs. Tickets are $10, but it’s wise to reserve your spot with president@austinherbsociety.org for the super goodie count!